Oh but he has all the charm and love now, if not more so!!! He is adorable. It's so wonderful you still have him! He's adorable! 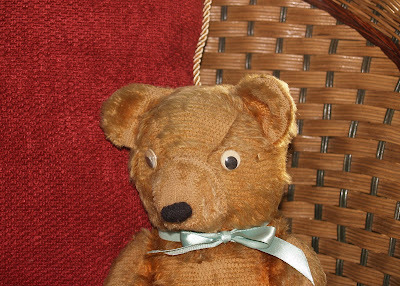 I love it when someone keeps their first bear; it shows they are very sentimental. He's been well loved! Thank you for sharing and have a wonderful weekend. What a sweetie! He has been loved a lot, and it shows wonderfully. Teddy is so sweet!! He has been loved alot , and those are the best ones!! Betty! I didn't know you had a blog until last night when we were over at Theresa's! Also, you've taught me that Sadler teapots exist! I love the Shakespeare one, if you ever have one in your antique booth please let me know! I want to come up and see your booth! "NOTHING is better than seeing a well loved bear"!!! OH YES there is something better, "OWNING a well loved bear"!!! 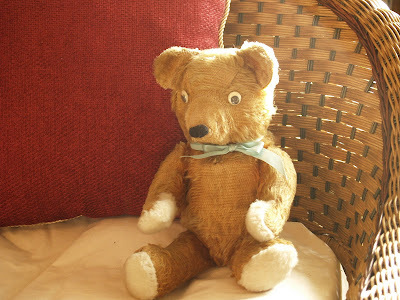 OH YES there is something even better, "OWNING YOUR OWN well loved bear"!!! OH YES there is something EVEN BETTER, "OWNING YOUR OWN well loved bear AFTER it's been through your own Little Kiddies"!!! hehehe! I had to say that, I'm a bear collector AND I "LOVE YOURS"!